The village of Dupo was founded in 1907, named Prairie du Pont, or Bridge Prairie. The name was a possible foreshadowing for the town’s nearness to the Jefferson Barracks and Poplar Street bridges, which link St. Louis to the region. The village arose just a few years after the Missouri Pacific Railroad extended its train yard there. Now a Union Pacific Railroad hub, the railroad itself has been extended even farther; it connects 23 states and covers 32,100 route miles in the United States, making Dupo an ideal location for the transportation of goods. 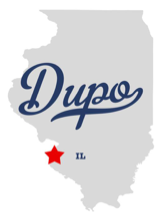 With Dupo’s combination of rail, river, and road and its proximity to downtown St. Louis (only 20 minutes), the village is a prosperous place to set up business.